Belize NMS: Moderate and relatively moist east-southeast airflow. 24-hour forecast: Cloudy with some light rain over the north this morning and a few showers or thunderstorms mainly inland this afternoon. Showers will increase over most areas tonight, especially over the coast and the north. General Outlook: Cloudy with generally isolated showers or thunderstorms during Saturday, then a few showers and thunderstorms mainly over the coast Saturday night. Today E-SE 10-20 kts Choppy-Rough 4-6 ft LIGHT RAIN IN THE NORTH THIS MORNING, THEN ISOLATED SHOWERS. Tonight SE 10-20 kts Moderate-Rough 4-7 ft SOME SHOWERS AND THUNDERSTORMS. Tomorrow E-SE 10-20 kts Moderate-Rough 5-7 ft ISOLATED SHOWERS OR THUNDERSTORMS MAINLY NORTH, DECREASING. Outlook SE 10-20 kts Moderate-Rough 5-7 ft (SAT NIGHT) A FEW SHOWERS AND THUNDERSTORMS. A tropical wave is over the W Caribbean. See above. Scattered moderate to isolated strong convection is inland over Central America from the Yucatan Peninsula to Panama. 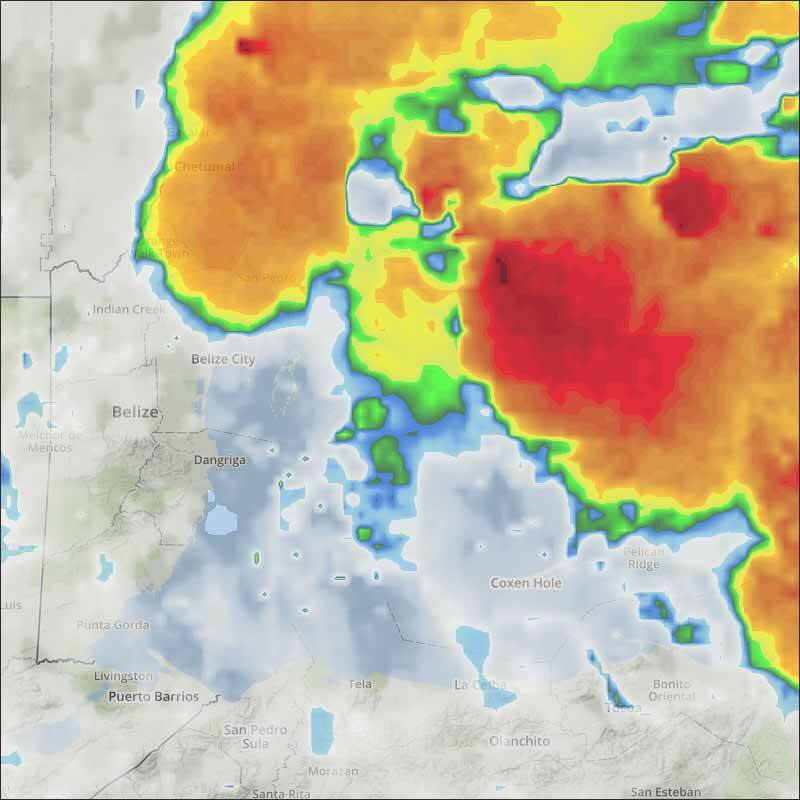 Similar convection is over N Colombia. 15-30 kt tradewinds are over the Caribbean with strongest winds over the central Caribbean between 70W-85W. Mostly fair weather is over the E Caribbean. In the upper levels, diffluent flow is over the NW Caribbean enhancing convection. A large upper level ridge is over the remainder of the Caribbean with axis along 72W. The tropical wave in the central Caribbean will continue westward across the remainder of the basin through the early part of the weekend, while another tropical wave currently in the Tropical N Atlantic will move into the eastern Caribbean on Fri and Sat. Strong trades across the central Caribbean between 70W-85W will diminish this weekend. The hurricane, top left red circle, is now down to just a depression, but still listed as TROPICAL STORM BUD but it is reducing. 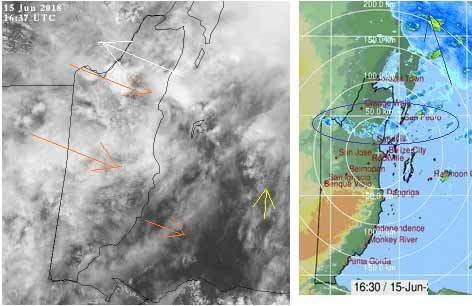 But there are three areas of intense ITCZ Monsoon band activity, orange circles. One listed as INVEST 91L which is listed as in the Gulf of Mexico as shown with a blue circle, there is only relatively small swellup activity there, but the Caribbean cloud is pushing across there from the SE. INVEST simply means a location for watching and investigation, not necessarily a developing storm. The three orange circles are far more active, showing in dark red on the second picture. 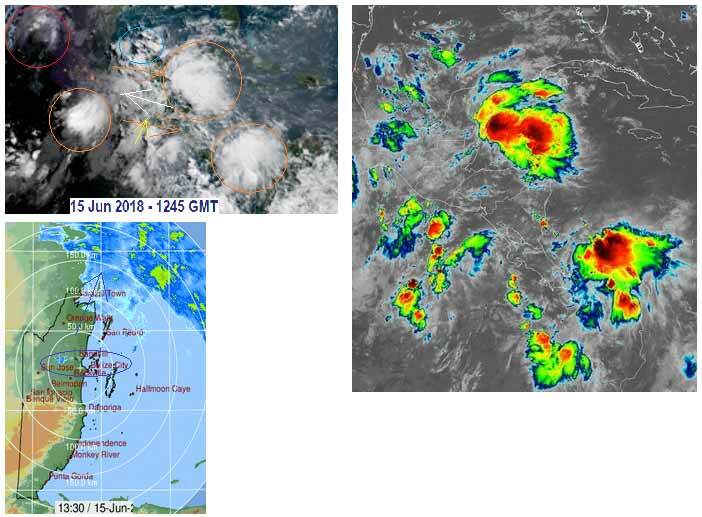 These are not threatening Belize at present, but they do indicate a lot of significant ITCZ activity near and around Belize, which means one could, some day, be over Belize, we are well in the rainy season now. Looks as if today is going to be rather mixed, periods of sunshine, cloud and the chance of rain showers. The Cloud and Rain picture. There is a large area of ITCZ swellup causing a lot of rain just to the north of Belize, mainly out at sea. There are a few areas of rain further south, mainly in the Orange Walk district. There are small swellups in Guatamala and there could be some later in central Belize, causing some rain patches later.